Actual photograph of my new quilt. Isn't it pretty? Welcome to the Homemaking for Beginners series, your 12-step program for getting your home back on track. QUALITY OF LIFE. That's what it's all about, folks. You might have tried several of those yourself. You know why none of them work for us? Because the writers of those plans don't know you or me. The plans may seem to work for a while, but since they were developed to suit some internet stranger's home and life, they don't work for us long term. Together, that's what we're going to do--device a custom schedule just for you, that fits your needs and your life. We'll get to the accountability group in just a moment. Get yourself a piece of paper and a writing implement. (At the bottom of this post you can find instructions for downloading my handy-dandy worksheet and checklist for this). Make a quick list of everything you believe ought to be done on a daily basis to keep your home neat and tidy. We're not getting the place ready for the cover of a magazine here. This is a list of tasks that you believe must be done in order to make the claim that the house is in order. From that list choose just three items that you will commit to doing every day without fail. It doesn't matter to me or anybody else what three items you choose. For now just choose the ones that you think are the top priority for advancing your quality of life. Three things, every day. One of them to your best and highest ability. Lastly, and this is critical: decide on a simple, easy reward that you can give yourself every single time you complete your best and highest task. DON'T MAKE THIS DECISION LIGHTLY! If you decide to reward yourself a homemade frappacino every single morning, pretty quickly that is not going to feel like a reward--it's going to become another thing on your To-Do list and it will be a burden. Make your reward something so simple that it would be foolish to not take your reward. (Don't panic--nothing you put on this list is definitive. You can, and should, adjust later, after you've tested your list a few weeks to see if it is working). 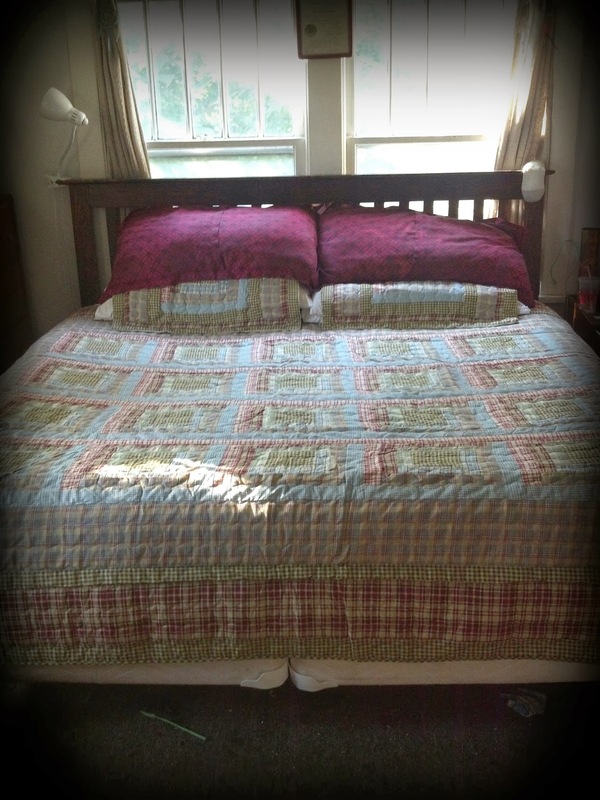 The one that I do to my best and highest ability is making the bed. I make the bed every single morning to 5-star hotel standards (Yes, I actually went online and watched videos of professionals in 5-star hotels making beds). I do this because at the end of a busy day (which, let's face it, is every day, amirite? ), a crumpled sheet and a lumpy pillow just add insult to injury. Preparing a haven to rest in, for myself and my loved ones, is my way of expressing my care for them and for myself. Now this picture makes sense, right? Later this week I'll show you what makes this my best and highest ability. What's my reward for making my bed to 5-star hotel standards? I get to open the curtains behind the bed and let the sunshine in. This is a real reward for me, because I am a sunshine hog and if it were up to me, the curtains would be opened the minute my eyes open in the morning. Not opening them until I finish the bed feels like I've earned the right to my sunshine! The other two tasks from my Daily Three are on the "done is better than perfect" plan: they get done. Nothing fancy to see here. Oh yeah--accountability group. Let's check in with each other during the week. Leave a comment telling everybody what your Daily Three items are and how they are working for you. At the end of this week, you'll have a chance to join the Brag Book and show off your new mad homemaking skillz. SO--I've created a little newsletter so that I can give out presents. Yay! When you join the Homemaking for Beginners newsletter, you will automatically get access to all the worksheets and additional materials for this series as they become available--plus the occasional video or audio pick-me-up. I promise I will never give out your email address, but from time to time I will tell you about special deals I am offering on classes or materials. (Don't worry, you can always unsub later if you like). Yay, Lynda! Come back when you are ready and tell us how it is going! Day one for me is today. My daily 3 are the same as yours for now. Make bed, 1 load dishes, 1 load laundry. I forgot about making one perfect today, but I did them and feel good that they are done. I've realized that I have a pattern in my house, which is: get organized, think "wow, I have more time now and things are going well! ", I then get busy doing other things and ignoring the house, the house "falls apart", I feel overwhelmed, I strive to get back on top of things but it takes a long time, repeat cycle. I would love to get to where I'm at least doing these 3 things every day, no matter how tired or busy I am so that the house is more consistent. I need this! You can do it, Carrie! You really can! It might take a few weeks of trial and error to see how to make it work just right for you, so keep going. Eventually you'll get a good rhythm and it will all come together. Good for you for diving in! So far, so good. I've been doing my 3 and it's making a difference, I think. The house isn't perfect, by any means, but it seems like when I get these 3 going, I have more motivation to take another step and do more. I'm trying to put an X on my calendar, Jerry Seinfeld style, and not break the chain. That seems to be helping. I see someone else is using a 5 min stretch as a reward. I like that idea! Ok. My mom sent me this blog and I'm ready to try! I desperately want to be 'on top' of my house instead of being drowned by it. I made my list and picked dishes, bathroom, and living room as my 3. Living room is my TOP chore since we spend the most time in that room. I wrote out all the steps and there are 14 but if I do it every day, it shouldn't take me more than 15 minutes. Day 1 will probably take more like 30 though. However, if my living room is presentable it will be a big weight off my shoulders! ... just thought of another step needed. Oh dear! Hi Molly! Good on you for choosing such a healthy reward! My 3 are: laundry, dishes, and deal with the mail. I think the one I will focus on for my very best job is dealing with the mail, because otherwise I feel the paper becomes some kind of magnet. For my reward I'll probably read blogs or something for a few minutes, because my desk will be clean and I'll be able to get to my computer.